When having your vehicle repaired, the parts of your vehicle that are most important are the unseen parts. These are the areas that effect the safety of you and your passengers. Vehicles are designed to protect the passengers in the event of a severe accident. 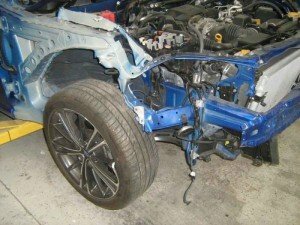 It is critical when repairing the structural components of the vehicle that the designs remain intact. If the vehicle is not repaired back to it’s original design and intent, then in the event of another accident, the air bag system can fail to perform as designed to protect the occupants. At Express Collision Center we use state of the art electronic measuring systems to ensure your vehicle is restored back to the original manufacturers specifications. You have many choices of shops you can take your car to for collision repair, but you need the best in the business. Express Collision Center, found at 5450 Desert Point Dr., Las Vegas, NV 89118, has been serving the Las Vegas area with exceptional quality collision repair for many years. We are trained to handle vehicles from GM, BMW, Volkswagen and Audi, and are experts at restoring automobile bodies to restore them back to original condition. If your vehicle is in an accident, bring it over to Express Collision Center where we can give it expert attention for collision repair. The body can be restored back to its original condition. Our master paint technicians can match your paint job perfectly. Your car is an important part of your life, and for a machine you rely on every day to get you where you need to go, let us put our care and expertise into maintaining it properly. So stop by our shop for all of your collision repair and any other auto body work you need! Express Collision Center, the auto body masters; call us at (702) 676-2010 today!